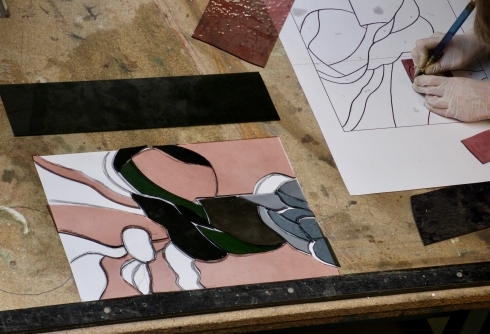 As part of my 5x week exploration of stained glass in Europe, I was invited to teach a workshop for Peli Glass in Zoetemeer, a suburb of The Hague, looking at principals of design as they apply to stained glass and glass painting in particular. 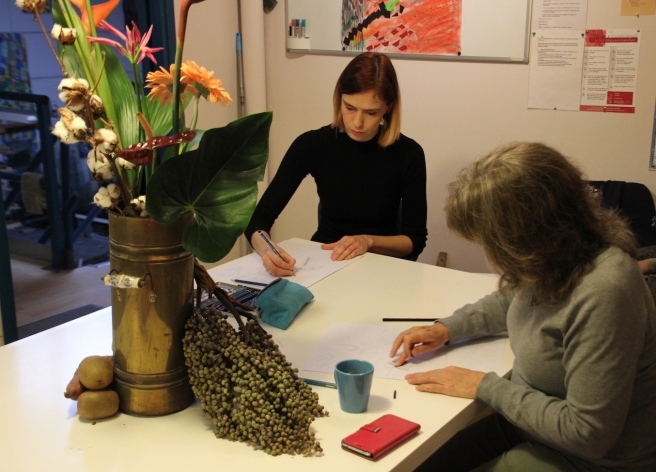 It was a small workshop, with only three students, but no less exhausting for that. We began on the Friday evening with a slide show and a session examining basic design through additive composition, the results of which can be seen in the group photo above. 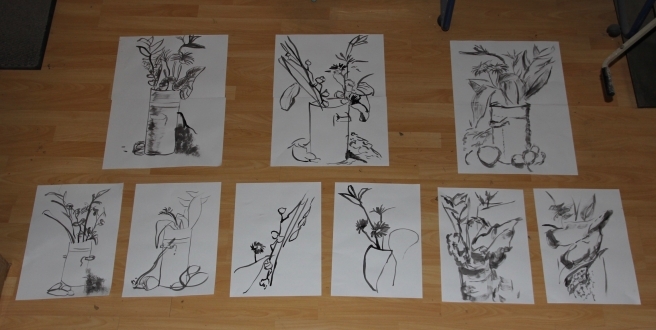 Saturday morning kicked off with a series of quick sketches in brush & ink and then charcoal (above) to loosen up and familiarise themselves with the still life, the subject of a longer study in graphite and/or charcoal. 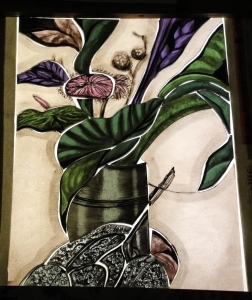 The students were then set the task of converting this drawing into something that could be cut out of glass, all the while deciding what is to be painted and what defined by leadlines. 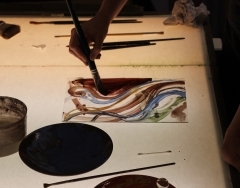 Once the glass had been selected and all cut, students then placed theglass assembly over the original long study and began to paint the trace line. overnight. This allowed for another exercise to run concurrently, something much more free and experimental. There wasn't time of course to actually build the panels but I was certainly pleased with the results and each student went away with a head full of new ideas and techniques. And I continued on my journey, catching the train back to Amsterdam to see firstly the Rijksmusem, then Cobra and Jan van der Togt Galleries before catching a train to Paris for 12x days. My whole European sabbatical was structured around this workshop at Peli. It was the trip of a lifetime, with enough inspiration & photographs to fill twenty blogs! Zoetermeer, NL (near Den Haag). 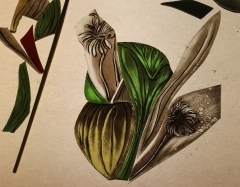 This workshop will provide the opportunity to bring your work to new levels and tap into new creativity in stained glass design. Come with an open mind! Workshop presented in English. Minimum 4, maximum 6 persons. "Jeffrey Hamilton is an artist with more than 30 years experience. 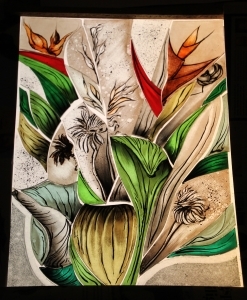 He is passionate about most forms of art and specifically painted glass. He graduated in 1974 with a diploma in Interior Design from Randwick College where attention to detail and fine craftsmanship was emphasized. In 1979 he began training as a glass painter, first concentrating on religious windows. Over the years he has been hugely involved with, and inspired by, the art scene in Sydney". 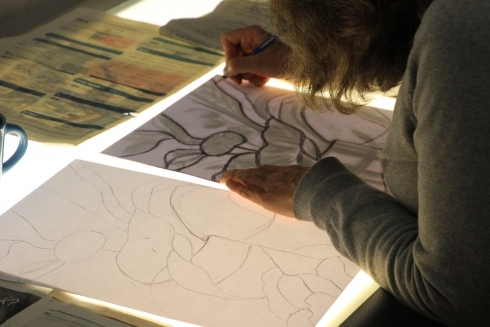 Workshop participants must have some experience in stained glass design / glass cutting, and stained glass painting. 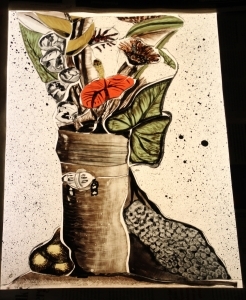 During the workshop participants will be provided with: paints, mediums, glass, use of the kilns, food, drinks/coffee. A workshop participant is entitled to a 10% discount on all paintbrushes, 5% discount on all sets, and 10% discount on all paints in stock purchased from PELI Glass. This is valid from time of payment until one month after the workshop. "Wanted to let you know how impressed I am with your course. Will be referring you to the committee in my survey response... From you we received great tuition, well structured, very well prepared and very personable. 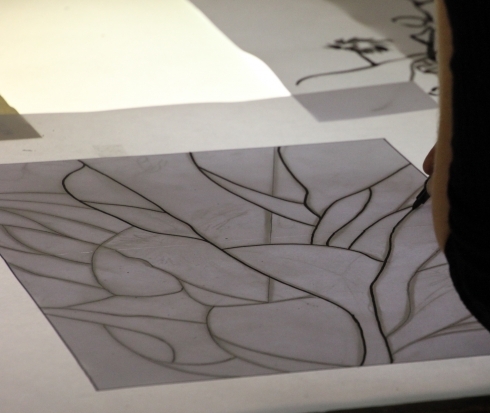 As a bonus we were given insights into the technical aspects of stained glass and its history. This year's course (2014) was even better than 2013. Hope to enroll with you in 2015." 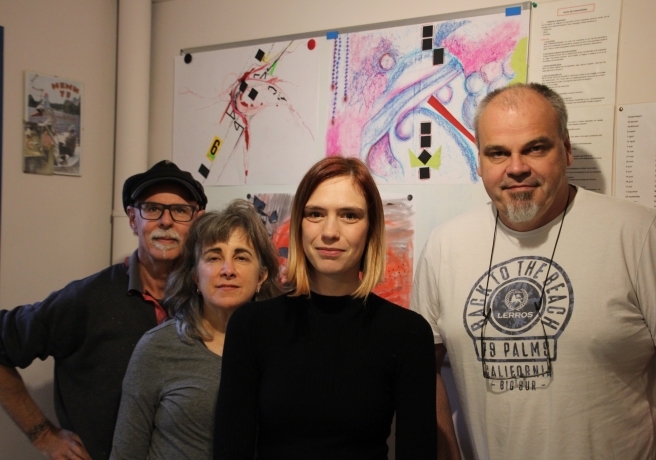 "I was taught by Jeffrey Hamilton, some years ago, I can tell you he is the BEST PERSON to teach you leadlighting, painting on glass and foiling... Whilst there in his old studio in Lane Cove, I and my fellow participants learnt many things from Jeff. The more difficult the pattern the more accomplished you will become. I know he pushed me to the limits." "Thanks so much for teaching such a great class. It was so much fun and it was great to be able to produce a completed stained glass hanging. I can't wait to start my next project!" Cost: € 395 ex VAT. Interested? Check out our webshop for more details. Request a non-binding offer today!